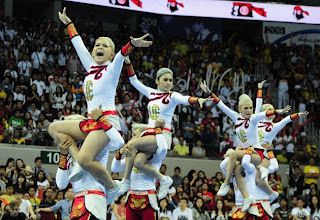 The University of the Philippines (UP) Pep Squad bags the championship in the UAAP Cheerdance Competition 2012 for the third straight year held at the SM Mall of Asia Arena on Saturday, September 22, 2012. 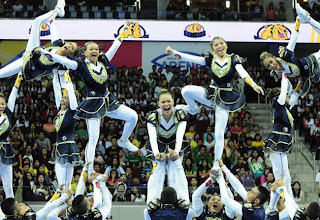 It may not be a flawless routine due to the mishaps in the closing stages wherein a fall marred the last stunt, yet still UP Pep Squad outperformed their rivals because of the outstanding overall rendition and execution. The difficult and breathtaking performance of aerial stunts and transitions earned the nod of the judges. 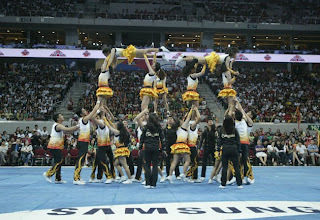 Eight competing pep squads joined the competition – UP Pep Squad performed with a shaved head to signify equality and freedom inspired by their famous symbol the Oblation, the UST (University of Santo Tomas) Salinggawi Dance Troupe on their Brazillian theme, the FEU Tamaraws(Far Eastern University) with its jungle inspired theme, NU Bulldogs (National University) Cheer Squadron with its Disney/royale inspired number, DLSU Green Archers (De La Salle University) Animo Squad dons gloves in a boxing inspired theme , Ateneo Eagles (Ateneo de Manila University) Blue Babble takes on Japanese anime in a routine capped off with a Voltes V replica., Adamson Falcons (Adamson University) Pep Squad goes K-pop and UE Warriors (University of the East) Pep Squad channels immortal gods in their cheerdance rendition. A point is deducted from the groups for minor errors, while major errors are penalized five points. This year’s competition judges came from various international bodies such as the Asian Federation of Cheerleading and cheerleading officials from Chinese Taipei, Romania, Indonesia and the United States. 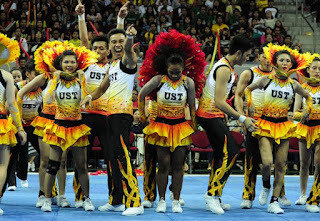 Although I am an Alumna of the University of Santo Tomas, I am not that satisfied with their performance this year, hoping they could get back to the limelight next year as they are the winningest squad in the annual competition. Anyway, there’s still a lot of time to practice and prepare – Go Tigers! Viva Tomasino! !